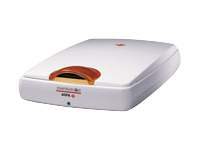 Agfa offers the SnapScan e20, the member of the "e" series scanners. The SnapScan e20 combines the award-winning SnapScan technology with advanced software to make it easy for new users to communicate with pictures. Agfa's unique ScanWise scanning software automatically formats scanned images for email, word processing, text conversion (OCR), Web pages, or image-manipulation programs. For those who want to turn their digital images into high-quality traditional photographs, Agfa includes AGFAnet software. This dual-platform scanner (Macintosh and Windows, including Windows 2000) offers USB (Universal Serial Bus) connectivity for fast, on-the-fly data transfer.